Fred Beckhusen (aka “@Ferd_Frederix” of http://www.outworldz.com/) has provided many fine open source contributions in OpenSim, including a range of animated non-player characters (NPCs). One is a dog called “Cindy”, which can be used as an NPC or avatar. It is a mesh dog rigged for Opensim using the standard “Avastar” skeleton. Fred indicates that there is no particular need for the new Second Life “Bento” enhanced non-human armature when only creating 4-legged animals. Her name is “Cindy” and she is licensed as CC-0, so anyone can use it for anything. The easy way to get Cindy is via an OpenSim Inventory Archive File (IAR) at https://dl.dropboxusercontent.com/u/31305726/Cindy.iar if you have the ability to load that for your avatar on some grid. Or you can pick up a kit at hop://www.outworldz.com:9000/Virunga/126/168/25 – which can be reached by hypergrid to www.outworldz.com:9000 then click the sign that shows the “Virunga” region. You can also try to teleport from your hypergrid enabled home grid with the full “hop” URL above in suitable viewers, such as Firestorm. The box is in the middle of the village at Ruhengeri, lower left corner, next to the horse. A notecard in the kit explains how to activate the NPC which involves wearing the Cindy Avatar body, an animated tail shape and a full transparency “alpha” layer to hide the usual avatar. This requires the sim and server be set to allow Non-Player Characters (NPC). See http://opensimulator.org/wiki/OSSLNPC for details. The avatar version in the image above has an added “RUGGED AO” with a notecard in it to trigger some of the animations (for Stand, Walk and Sit) provided in the control “dog bowl”. “Cindy” has several features: She comes in a dog “water bowl”. Click it to control her. She can walk run around, Stand, Lay, Crawl and most importantly, pee on things. Cindy is set to wander and occasionally paw at the nearest avatar. 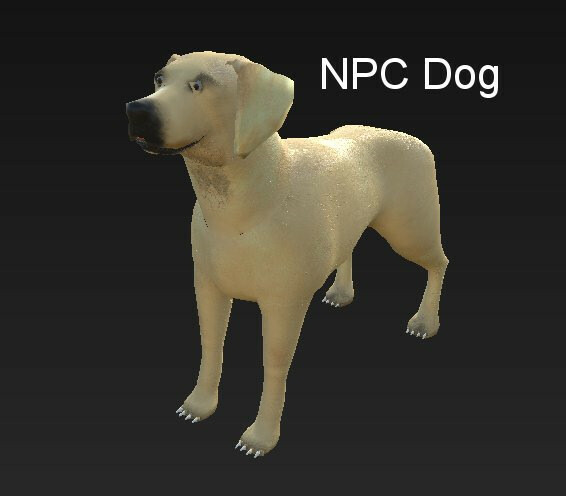 Since she is a NPC, you probably have to first become a dog and then click the dog bowl and select “Appearance”, once. There are instructions on how to make her in the box. This is because NPCs’ require moving of all the assets (which are really just UUIDs in a notecard), and different versions of the hypergrid do not always gather all the necessary assets. You could also wear it and be a dog. Just add the animations to the Firestorm AO, if you need really precise handling for scenarios. These are all in the water bowl. Then it will ONLY follow SOMEBODYS NAME. And there are several sensors, but you can search for them. If you take this box to another grid, it must be remade with a new NPC Appearance notecard. IMPORTANT! If you have not yet saved your current avatar outfit, go to Edit Appearance and save your outfit! Give it an outfit name that you can find it with, later. Wear (say) the default skin, eyes and hair… they will be hidden anyway by the “All Alpha” which renders all parts of the standard avatar transparent. Check that you look like a dog. Your front legs will cross inwards. You can correct this by playing the animation “Stand”, which is included in the box. This is just an ordinary T-pose. IMPORTANT!! Take everything else off. Take off ALL Scripts. Take off your AO. Go to “Avatar Appearance” in your viewer and click the “Wearing” tab, and make sure you are wearing just the basic body parts including the Cindy Dog Shape, along with the Cindy Dog Avatar, Cindy Dog Tail, and the All Alpha. Save this as a new outfit. Name it something like “Cindy Dog Avatar’. IMPORTANT!! Right click and wear your original Outfit. This takes off the Dog, which saves it to your server. You will re-appear as you were, but (in earlier versions of several viewers) may be very distorted. THIS IS NORMAL – DO NOT PANIC!. This issue is fixed in the latest viewers such as Firestorm. Click “Appearance”. The dog should appear and come to you. To restore your appearance, replace your outfit with the saved outfit. You will re-appear as you were, but as noted before you may appear distorted, an issue which is fixed in the latest viewers such as Firestorm. If your avatar is distorted, log out and log back in again. You should now be back to your original look, and will be greeted by your new pet! 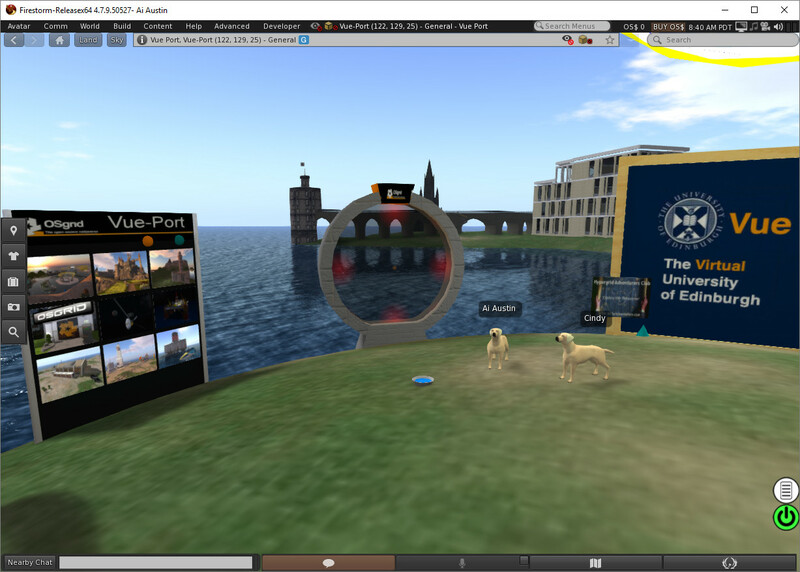 This entry was posted in OpenSim, Virtual World and tagged Cindy, Dog, NPC, OpenSim. Bookmark the permalink.